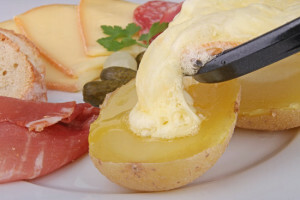 Book your Raclette Party now! Book your Raclette Party now to enjoy hot melted cheese with freshly baked bread and a wide selection of seasonal vegetables and pickles for only £15 per person. Great food and great fun in a cosy atmosphere at the Old Cheese Shop Cafe Bar. Contact us to confirm your preferred date and if you have any questions. The shop is available to host private events.